I have been looking for a good way to blog from my iPhone and iPad for a while now, and I think I may have found a promising solution. Up until now I had not been able to find an application that could do more than simply post text and image to a blog. Although that is nearly enough, I found email to be an equally effective tool for this. Why pay for an app which cannot offer any editing of image layout, or any other visual aspects, when you can do it for free via mail? Well, last night I finally decided to buy a blogging app to see if I could upgrade my mobile blogging. Enter BlogPress. BlogPress seems to offer quite an improvement over the old post-by-mail method. The things that stand out most to me (in the first 24 hours still…), are the ability to work with multiple blogs on multiple platforms, the ability to resize & align images, and the HTML menu. So far I have connected with both my Blogger account and this self-hosted WordPress blog. You can see that the images added to this post have been aligned, and the first was even edited to link to an external website. The second image is of the initial HTML drop down menu, and you can use that for a number of things. You can even include block quotes, which is a nice touch. Of course, if you are a bit old school, you can just type in the HTML code yourself. If I had wanted to use an actual HTML list for the items above, I would have had to written the code myself,as there is no such option in BlogPress that I can see. 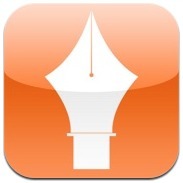 Overall, I would say that BlogPress is worth the current price of $2.99 (¥350 here in Japan). This was written by Stephen Henneberry. Posted on Saturday, April 16, 2011, at 1:43 pm. Filed under iPad. 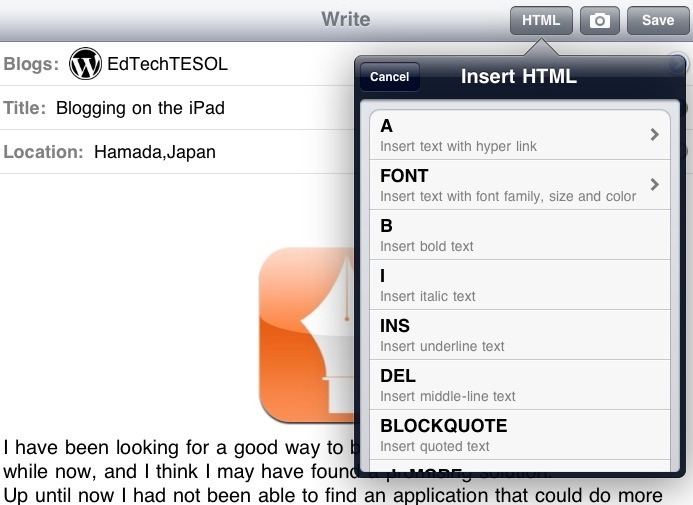 Tagged Blogging, iOS Apps. Bookmark the permalink. Follow comments here with the RSS feed. Both comments and trackbacks are currently closed.